As a parent, it’s important to build strong relationships with the staff at the daycare centre. The way to do that is to be open and honest about your child’s likes and dislikes, their behaviours and how they interact with you at home. Who knows your child better than you? Parents are the most credible source when it comes to their own child. An open and honest relationship with your child care centre educator can ensure you are all on the same page to do what is best for your child. At our Mississauga daycare, we believe honesty is the best policy – even if it is sometimes difficult. 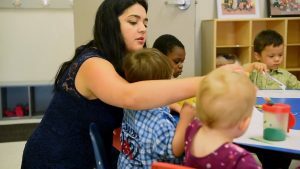 Our Mississauga child care centre offers detailed daily reports through an online app and we offer opportunities for parents to communicate any questions about our child care centre program. Parties and celebrations are always an exciting time for children, parents and educators. It is a time to let loose and celebrate various occasions in your child’s life. Your child will be so happy to see you attending an event and participating. At Alpha’s, we hold events on a monthly basis so there is always an opportunity to get involved. Keep a close eye for communications e-mailed out and posted around the centre to be able to join your child in a variety of opportunities at the child care centre. It is nice to see your child in the classroom and their interactions with others. Donating your pre-loved toys and educational materials is also a great way to positively contribute to your child’s classroom and build a new environment for other children to explore. Many child care centres and daycares welcome donations of toys and equipment as long as they are clean and in good working condition. It adds variety to the classroom and brings the child’s home environment into the classroom. Recyclable materials also make great donations. Educators are very creative with recyclable materials and reuse it in a variety of ways through art projects. At Alpha’s Preschool Academy and Child Care Centre in Mississauga, we love to engage parents in a variety of ways. It is our duty to make parents feel engaged with us and to have peace of mind that their child is safe and secure.